This post includes **Updated Information** below. Over my Thanksgiving break, I visited my Grandmother at her home for a while. Very often I get sucked into her many books on the history of Lexington, Missouri (my hometown), or even just the high school yearbooks of both her and my late Grandfather. Naturally, that is precisely what happened during this visit. I was super excited to find a photo of Ms. Verna Marie Owen in both the 1954 and 1956 Lexington High School yearbooks (the same photo in both, and included below on the right.) You may remember me mentioning and including a photo of her several months back, in a post titled “Collecting Someone Else’s Memories”, where I shared many of the photos and pages from the five 1920s era Lexington High School yearbooks that I have collected. It is just one of my nerdy hobbies, even though I can’t seem to find any other yearbooks from that era. 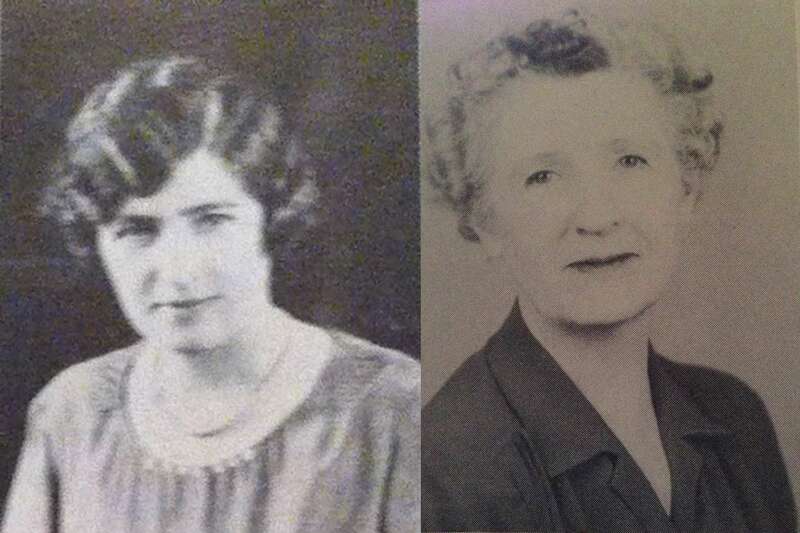 I believe that Verna Owen began teaching in Lexington for the 1927-1928 school year (see updated information below) (see the below left photo). I have the yearbook from that year as well as for the 1928-1929 school year. Both of these yearbooks were originally owned by Verna herself. Obviously, me now owning two of her yearbooks, along with my Lexington roots, and the fact that I am a teacher, has made me feel connected to her in some way. To prepare for this post, I did some genealogy research using FindAGrave and Ancestry. It made me a little sad to find very little information on this woman. Fortunately, Cathy Wallace, who is a great friend and Lexington resident who shares many of the same nerdy interests, went out of her way to fill in several blanks for us, including finding the obituary below. I told her I was going to have to give her the title of “senior reporter for BigSéance.com”. Thank you for the time and effort you put into helping us learn about and remember Miss Owen. Even though we’re unable to find an exact year of when she retired, she clearly had a long career in Lexington and touched many lives. I now have evidence of this, as people have left comments here and on the two Lexington community Facebook pages. Verna Marie Owen, 90, of Lexington, died Friday, July 25 in the Urbana, MO Nursing Home. She was born September 18, 1895 in Lexington to John Martin Owen and Carolyn Sellman Owen. She was a member of the United Methodist Church, the Lafayette-Lexington DAR and past matron of the Eastern Star. She attended school at Missouri University, Central Missouri State College and the University of Boldar [sic], CO. She taught school in Lexington for 47 years. She was a member of the Missouri State Teachers Association and the National Retired Teachers Association. She was a lifelong resident of Lexington. Survivors include four nieces and eight nephews. Services were held Tuesday, July 29 at the Walker-Nadler-Graff Chapel with Rev. Dan Sullivan officiating; burial was in Machpelah Cemetery. Both her and her parents (John Martin Owen and Caroline “Carrie” Whelan Owen) were born and raised in Lexington, and are all buried in Machpela cemetery, a Lexington cemetery that I’ve blogged about. It blows my mind to learn that as early as the fall of 1915, at the age of 19 or 20, Miss Owen was teaching 34 pupils at the Elm Park country school outside of Lexington. Again, it’s unclear when exactly she retired from the Lexington School District, but in recent days, former students have recalled having her as a teacher as late as 1965. That is simply amazing. I can’t imagine being there to witness all of the growth and change that public education went through during those five decades! During her long career in Lexington, she taught at least English and Social Studies to probably several junior/senior high grade levels, and for many years sponsored a “pen pals” program. According to the 1940 US census, at age 44 she was making a yearly teacher salary of $855. In recent days, former students have described her as being quiet, gentle, soft-spoken, sweet, and “one of my favorite teachers”. Alan talked of being paid to “porch” her newspaper for a few years in the 1970s each time it was delivered. Lucia sent me the cutest story (I’m adding it to the comments below) of how she would leave Miss Owen flowers on her doorstep on May Day. At the time of her death I was eight years old. I wonder if I ever knew her or if our paths ever crossed. Looking into her eyes, I just know she made a huge difference and was loved and respected by many. If anyone has more information, or if you’d like to add your memories of Miss Owen, or if you’re a family member, I’d love for you to contact me, or simply leave a comment. This entry was posted on Sunday, December 1st, 2013 at 4:29 pm	and tagged with 1895, 1915, 1986, antique photos, big seance, blogging, collecting, collecting old yearbooks, collecting someone else's memories, collecting yearbooks, collections, country school, doris long, elm park country school lexington, elm park school, elm park school lexington, high school yearbook, high school yearbooks, history, John Martin Owen, lexington, lexington high school, lexington missouri, lexington missouri high school yearbook, Lexington Missouri school district, lexington missouri yearbook, lexington mo, memories, missouri, obituary, old high school yearbooks, old lexington missouri junior/senior high school, old school yearbooks, old yearbook photos, old yearbooks, paranormal, seance, someone else's memories, teacher, the final hatch, Verna M Owen, Verna Marie Owen, verna owen, vintage, vintage photographs, vintage photos, yearbook collection and posted in Cemeteries, General, Old Yearbooks. You can follow any responses to this entry through the RSS 2.0 feed. Hmmmm, I’m remembering her frequently powdering her nose, and we called her, Ms Powder Puff. That’s about it. I had her for Social Studies during 1963-1965. She was very quiet, and gentle. OH I also remember she would have us all reading a text book chapter, and she’d fall asleep. That’s funny… I think. 🙂 After learning she began her career in 1915 in a country school, that explains the sleeping. I’d sleep too! 🙂 That is a massive career! This comment and funny story was e-mailed to me by Lucia. Additional information, an obituary, and former student memories of Miss Owen are now included in this post from yesterday. I don’t know anyone else, who did this May Day ritual like we did as kids in Lexington! Lucia’s description brought memories of YEARS of making flower baskets from bright colored construction paper, shaped in a cone, with a paper handle stapled, so we could hang it on a door! I’ve never heard of this tradition, exactly like this anywhere else. What do you think Patrick? I would actually cut my flowers my neighbors’ own yard to make them a May Day basket every year. They were wonderful ladies. A spinsterly mother and daughter, Marie and Betty Gray that lived on Garfield. Marie cultivated a the whole backyard into an entire flower garden. My own children have never learned of the May Day tradition except what I have told them about it and they think it sounds nutty. I remember it fondly every May 1st! That’s funny! Yeah, maybe if I had more experience in elementary education, I’d have an answer, but I definitely remember the May Day tradition as well… and remember making them just like you described, Aunt Sarah! This is awesome, and the comments make it even better. How many decades will you have taught in by the time you retire? (Assuming you continue to teach.) I suspect you’re seeing an awful lot of huge changes in the system right now. I can’t imagine what school will mean in another 10 years. I’ve thought an awful lot about that as well, actually. Even before learning so much about her this weekend, she was on my mind often in the last several years. Waking up so early in the dark to get ready yesterday, I thought about Verna doing the same thing in 1920 and in 1960. On the drive to school, I thought about the fact that she probably just walked to school… she lived close. I thought about her being single her whole life… but was she really? Was school her family? Was she a recluse like me when she was home? 🙂 So many things. But really, she got me through all of the stressful moments yesterday by thinking “If Verna could do this for fifty years, I absolutely must get through this day without complaining.” 🙂 And I had a pretty good day. Then there was the ghost in the classroom moment. And you’re right. I’ve seen tons of changes in education in just my 12 years… but 1915 to 1965 just seems like major formative years… lots of struggles, movements, and milestones. I suspect you’ll back on your career and think Vera has nothing on you. We are in the middle of struggles, movements and milestones now. In society, these next years will witness sweeping changes in technology use, civil rights, increasingly divided politics, and changes in the social order. I have to confess, I’m thinking specifically of the home school movement. Did you know that I taught The Boy here at home from 4th – 10th? (Now he’s in college to complete high school – he’ll graduate from HS with an AA.) Just FYI, it was for educational reasons, not religious or political. If the practice continues to grow, what will happen to mainstream schools? I know you teach in middle-school, which subject(s)? I know music is important to you … are you teaching that now? I’d love to get Scholar in on this conversation. Well now that you make me think harder, I suppose we are in the middle of big changes. By the way, I teach vocal music and piano to a zillion (estimate) 6th, 7th, and 8th graders. Fascinating! Loved that! Say, Patrick, do you know of Elmwood Cemetery in Kansas City, Mo? And the story about the young deer that lived there? I remember going to her house as a small child with my Grandfather Thomas Owen of Lexington who was a cousin. She had so much information on the family geneology. then you and I are related!! Her sister, Edith Owen Layne was my Grandmother! She is my Aunt…and was my favorite one at that. This is awesome!! I would love to know if you have any stories to share. Since researching her, I have felt an odd connection with her.